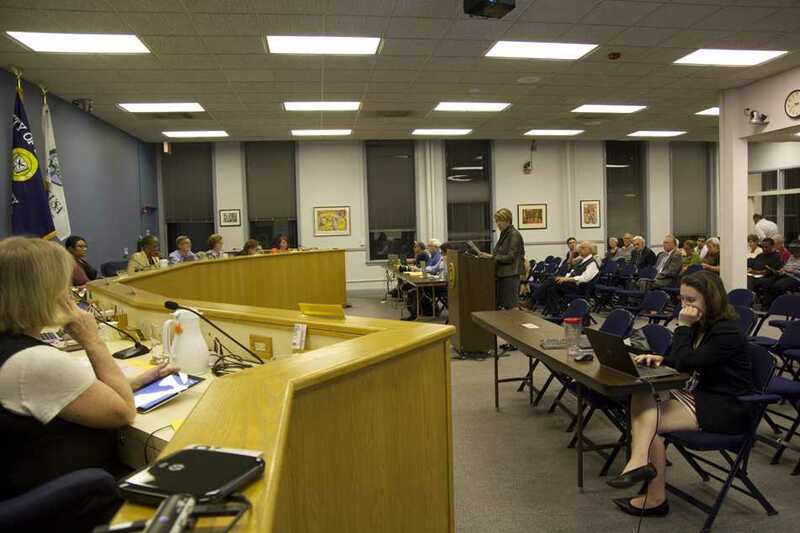 Evanston Art Center executive director Norah Diedrich spoke in front of City Council on Monday. Diedrich asked council for a $500,000 loan to close on the building where the center plans to move. City Council moved to go forward Monday with the negotiations for the lease and sale of the Harley Clarke Mansion to the Illinois Department of Natural Resources. The mansion, located at 2603 Sheridan Road, was previously occupied by the Evanston Art Center. IDNR said it would use the lakefront location to educate residents and visitors about the Illinois coast, Lake Michigan and the Great Lakes. Many residents and aldermen expressed concern over who would have ownership if IDNR were to no longer occupy the mansion. Ald. Judy Fiske (1st) asked city manager Wally Bobkiewicz to address the issue in his negotiations with the department. Bobkiewicz told The Daily that citizens want to keep the mansion in the public domain mainly because of its lakefront location. If the city approves, IDNR would have to buy the mansion — instead of leasing it — because they must own the building in order to receive their external funding. Bobkiewicz proposed a 99-year lease to IDNR. Fiske said that he could negotiate a trial period lease of 30 years. Ald. Donald Wilson (4th) said the city should wait to hear an offer from IDNR before changing the parameters of the agreement because the offer could end up being different than aldermen initially expected. The council could end up negotiating against itself, he said. Council approved to continue negotiations 7 to 1, with Ald. Ann Rainey (8th) dissenting. Evanston Art Center executive director Norah Diedrich asked Council for a $500,000 loan for the center. The move to the new art center at 1717 Central St. will cost a total of $2.5 million, including renovations and remodeling. In the 10 weeks of its capital campaign so far, the center has raised $1.6 million. Although the center has received a loan from First Bank & Trust, the staff needs the rest of the money in order to close on the building by Oct. 6 and hopes the city will provide this money. Bobkiewicz said the $500,000 would most likely come from the economic development fund and asked the council for direction on how to pursue an agreement with the center regarding the fund. Fiske and other council members said they did not think there was enough information given to them to make a decision on the fund Monday night. It was approved 7 to 1, with Ald. Coleen Burrus (9th) dissenting, to direct Bobkiewicz to negotiate the terms of an 18-month loan with the center.